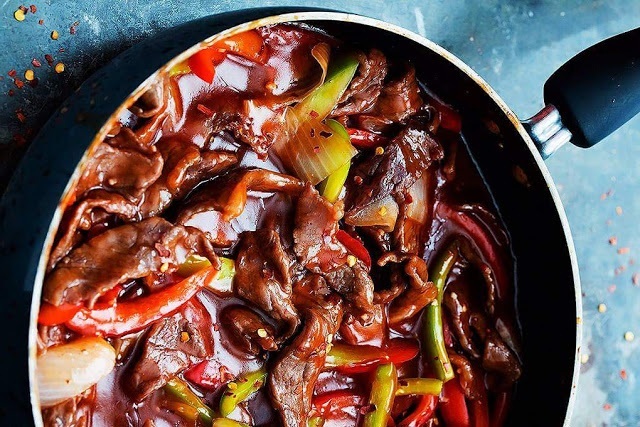 The most delicious Beijing Beef that tastes exactly like Panda Express, but healthier and much better than takeout. Add sliced steak to a large greased skillet and saute over medium heat 2-3 minutes till just browned. Add peppers and onions and saute 1-2 minutes longer. In a medium bowl whisk together water, sugar, ketchup, vinegar, and garlic. Add to pan with the steak and peppers and stir to coat. Cover and bring to a boil. In a small bowl stir together cold water and cornstarch til dissolved. Add to pan and stir until thickened. Serve over cooked rice.